Liverpool midfielder Javier Mascherano arrived in Barcelona at lunchtime today as he moved a step closer to setting up home in a country where he hopes his wife will be happy and where in turn he will be able to finally enjoy something approaching normal family life. His desperation to see his family happy has, according to reports in Spain, personally cost him over €3m. He’ll be unveiled to fans on Monday, subject to passing a medical. Mascherano played a vital role for Liverpool during his three and a half years at the club. Although he started last season with his mind clearly on other issues he has on the whole been treated as a hero by most supporters since he arrived at Anfield, initially on loan, in 2007. But no matter how he felt about his time on the pitch it was his home life that was troubling him of late. He was desperately unhappy that he was unable to spend a great deal of time with his wife or young family after his wife had been unable to settle in the country. She spent a lot of time back in Argentina and it was clearly not the kind of situation that can go on without causing lasting problems for all concerned. It’s understandable he was looking for a move. Despite his unhappiness and his desire to see an end to those personal problems his professionalism against Arsenal in his only game for Liverpool this season was obvious. And any doubts fans might have had that his reasons for leaving related to any kind of grudge against the club or its staff should have been dispelled by his comments whilst on duty in Ireland for Argentina. He had nothing but respect for Liverpool FC and its fans, but personal pressures meant he had to move on. But it seems Liverpool’s new manager doesn’t do empathy. Sending Mascherano on his way to Spain with a blast in the ear the increasingly prickly Roy Hodgson branded him as “selfish”. Rumours from the club on Monday suggested Mascherano had refused to play against Manchester City. Some of those rumours also gave Hodgson a partial excuse for the embarrassing 3-0 defeat by adding that Mascherano’s alleged impromptu strike action had forced the manager to change his tactics at the eleventh hour. But sources close to the Argentine captain reportedly denied he’d refused to play, insisting the decision to leave him out of the clash had already been taken on the Saturday, two days before the game, by a manager who was concerned about his state of mind. That gave Hodgson ample time to prepare his side. The club are yet to confirm in any official capacity that he refused to play. The failure of the club to set a deadline for Mascherano to leave without it eating too far into the league season is as much to blame for any hostility as anything Mascherano himself has done. By the time Liverpool faced City there were only 8 days left to go until the closure of the window. Mascherano had picked up a knock against Arsenal and must have known there was a good chance of picking up an injury sufficient to rule him out of any medical for a new club in the days that remained. For someone who saw that move as such a key stage in his life, let alone career, it’s understandable if he was reluctant. As the week went on Hodgson had perhaps been briefed by his management on how the negotiations were progressing and the new manager decided to go on the attack against the Argentine: “It’s not easy to defend his actions. Professionals are paid to play and, when called upon to do so they should. But that’s not what Mascherano was told. He was told Liverpool were selling, as long as the right bid came in. And Roy contradicted himself to a certain degree when he admitted he’d not taken the player to Turkey during the week in case it scuppered the transfer. Mascherano being cup-tied in Europe until Christmas may well prejudice the transfer, but so would an injury that left him unable to undergo a medical for a new club before the closure of the window. It seems odd that the manager was willing to refer to Mascherano as “selfish” for missing Monday’s game yet left him out of Thursday’s squad for what boils down to the same reason. And that “very good” offer would prove to help Liverpool receive the fee they had been seeking. That offer had been enough to block Barcelona’s highest – and what they said was their final – offer. According to reports in Spain it was only a sacrifice from Mascherano that put his move to Spain back on. Barcelona’s vice-president, Josep Maria Bartomeu, met Liverpool’s MD Christian Purslow and Eduardo Macia (chief scout but seemingly operating more like a director of football in the past few months) in Manchester on Thursday to try to do the deal. Barcelona’s bid was reportedly short of the required price by more than €3m but they were unable or unwilling to go a penny higher. And that’s where Mascherano stepped in. He had his heart set on a move to Barcelona by now and came up with a solution to the impasse. He would pay the difference between Barça’s final bid and Liverpool’s asking price himself. He asked Barça to reduce the amount of money he was entitled to in his new contract by a sum equivalent to the extra money required by Liverpool, and for Barça to add that onto their offer. It did the trick; Liverpool accepted the new offer. If the Spanish reports are correct, Mascherano was a long way short of being the selfish mercenary he was being billed as in England. He was desperate to make his wife and family happy and was unwilling to risk missing this opportunity again. He effectively paid over €3m to move to a club in a new country. Even without knowing he would give up over €3m from his new contract it was well known why Mascherano was leaving. Hodgson’s “selfish” comments were quite unnecessary and, some might say, extremely ‘cold’. Those comments, tied in with the rumours from Monday, led to a backlash against the player. Observers unwilling to consider for a moment that there may have been some exaggeration in what was said, or at least a lack of context, condemned the player without considering there is usually more than one side to a story. With reports that Roy is going to use the money received from Mascherano on at least two replacements it’s extremely clear that the club – and indeed Hodgson – needed this transfer as much as the player did. Why would he say this if his family life was in turmoil? I don’t think your article stacks up Jim ! great post jim. agree wholeheartedly. cecil screwed the pooch on this bigtime! and Woy has not covered himself in glory either. He did refuse to play, I know this is a fact. We didn’t need the transfer as much as he did either. We would have happily kept him. We would have also been in a better position to get his true market value if the disrespectful little tramp hadn’t spat the dummy and refused to play against City. As soon as he decided he didn’t want to play for us his market price llunged and as only one club came in with anything that could be considered a serious offer, we were lucky to get as much as we got for him. I fully understand that he wants to move for his family, but he was bang out of order to act in the way he did. And let’s face it – three million euroes is not a lot of money comapred to what he will earn in his time at barca, never mind compared to what he will earn in his entire football career. Why should Hodgson who has had such a limited time with the players speak about Mascherano in anything other than “cold” terms. He owes Mascherano nothing. Mascherano on the other hand did owe this football club something, but he chose to spit in the face of all the fans that have paid his wages since we rescued his scruffy arse from West Ham. Well Said Jim, ive been arguing the same thing with over the top “supporters” who turned on Masch in a disgusting and hypocritical manor. There has been no proof apart from “club sources” and bulls**t media hyperbole. Ive wrote a couple articles lately stating this is down to the club as its ridiculous that this has dragged on for over a year and got down to the last few days of the transfer window before being completed, seriously effecting the clubs start to the season. No doubt the Purslow spin-machine is in full effective with his leaks to the sneaky little rats in the media to take the pressure of his new yes man at Anfield. Great article Jim, the club are a disgrace dealing with Masc in this manner, I think he’s being picked on because he was one of Rafa’s favourites. Hodgonson should be ashamed of himself, your right he has that small team mantality – just making excuses for two terrible results. Agree with cory, great post jim. These current fellas running the liverpool ‘brand’ are unbelievable and disingenuous. Monster was always going to leave not just because we didn’t make the Champions League but it was widely known his family were unhappy. Football business means that both the player and the club flex their muscles at various points – and in this instance the loss of monster suited both parties, as Jim alludes to. But Monsters transfer, as much as it hurts, is just a smokescreen. Liverpool FC is now a selling club. We have brought in untold amount of money from transfers from Rafa’s time til now and yet the club continues to buy players less recognised that the ones we sold. For that we can go back and blame Moores and Parry and now the current ‘custodians hicks and Gillett….and their stooges broughton and purslow. One report suggests the clubs has made some 40 million on transfers in recent months. Where is that money going? Not to Roy, who has disappointed me buying Konchesky – and no doubt selling Insua at a profit. But that money has gone to paying off the interest of the debt. Monsters leaving must be seen for what it is….a sign of not player power but our beloved club being put under the knife by Hicks and Gillett. Until Broughton delivers a worthy future owner, he (and purslow, the player transfer negotiator it seems!) should be tarred with the same brush. Come on guys, look at the whole transfer saga. Mascherano was promised last year, that if he stayed he would be allowed to leave if a suitable offer was made. This offer was made before Roy Hodgson came and he had to accept it. Mascherano was widely held as ‘one of the best in the world’ and should have been worth at least £25M. Inter knew this and so did Barcelona. If either side had offered a fair price back in July, Mascherano would have left then. Unfortunately they wanted him ‘on the cheap’. So, they talked to his agent and agitated to make sure that the transfer took place slowly. Mascherano’s refusal to play against City was spiteful, and showed no loyalty to those supporters that had paid his £80K per week wages for so long. Remember, no-one wanted to touch Mascherano when he was playing for West Ham reserves. Liverpool took a chance, and have made Mascherano into the player he is today. If he has chosen to give Barcelona 9 months wages for signing him that’s his problem. Frankly I as a Liverpool supporter for 50 years, I wouldn’t cross the road to shake his hand. I’m going to buck the trend here and support Roy’s stance. I don’t think there is ANY excuse for a professional footballer to refuse to play if that is indeed what happened. No-one seems clear on the actual events. There is too much player power and it needs reigning in. I appreciate Masch was desperate to move but refusing to play to force it is tant amount to having a strop until you get your way. Ultimately, we got more than we paid (apparently) and he got his move. Whilst the club will miss his skills on the pitch his probable replacement – Meireles will hopefully slot in nicely and do a good job for us. I was as surprised as many of us at how poorly we played on Monday. The next few games will tell us if that was an aberation because of the Masch situation or whether there is something more fundamentally wrong with the team / formation. Spot on Phil… He is at Bara because we paid a lot of money for someone rotting on the Hammers bench. He is now the Argentine captain, why should he go on the cheap. He showed no class last week by refusing to play…YNWA… He let us walk alone last week..
What a load of crap he was just desperate to play for Barcelona and he should have just admitted it how was his wife going to enjoy living in Italy(at Inter) if she didnt enjoy England cos she couldnt speak English can she speak Italian. He used his wife as an excuse it was more about the club he wanted to play for and he has got his wish so why feel sorry for him. We all know he wanted to go which is ok but he still should have had his mind on playing for Liverpool while he was our player it lacks professionalism, do you really think Hodgson would have played Lucas if Mascherano was available. Stop slagging the manager off. Funny the way Mascherano said he wanted to leave because of his Spanish speaking family, but he was willing to leave for Inter Milan. Wonder if his family could speak italian? I specifically remember the language issue as something he raised. Not the fact that they didn’t like England. So would these problems have been sorted by moving to Italy – which he indisputably intended to do? And as for the £3m, my heart bleeds for him! Let’s say he was offered a £20m contract by Barcelona over a five year period (and no I haven’t checked the length of contract but the principle would be the same), that would be £4m a year, which equates to £77,000 a week. Now let’s deduct the £3m from the £20m and we now have £17m over five years which is £65,000 a week. Like I’ve said above, my heart bleeds. He can only afford a Range Rover once a week now instead of a BMW M3. Those figures don’t even include the other ludricous amounts footballers receive these days got sponsorship and the like. I’m surprised by the article Jim, it’s clearly quite negative about the manager, maybe you know things we don’t? You’ve questioned Roy for leaving him out the European game because he didn’t want him to get cup tied. Makes sense to me, and a favour to the player. Yes he wanted to play him against city, but I don’t think that’s contradictory to be honest. He probably thought that in such an important game, it would be better to play Mascherano because it would be highly improbable for him to suffer a bad enough injury for the deal to not go ahead. Are you intimating also that Hodgson lied about Mascherano’s refusal to play? Oh dear, I really hope that isn’t true because I’d rather have a thief than a liar. If there is one thing that Roy appears to have, then that would be honesty. Maybe I’m being naive but I think most Liverpool fans have applauded his straight talking and communication skills – a far cry from Rafa’s cryptic musings. Increasingly prickly Hodgson? Why? What else has happened. He expressed amazement that the media have tried to present the man city defeat as a watershed moment for the two clubs. I agree with him. We had several poor performers on the night, but I can’t accept that Man City are a better team all of a sudden. Mascherano may not be as bad as the media and the likes of the PFA (Gordon Taylor – who normally defends players with embarrassing excuses – called Mascherano’s actions ‘tantamount to treason’). He’s a professional footballer, if he was picked to play at City he should have played. Shankly would roll in his grave. And it shouldn’t be forgotten that it was Liverpool that got him out of a very tight spot at West Ham. That reminds me, why did he ever go to West Ham, who were in the bottom half of the Premier League at the time? One thing I can say about your columns Jim, they are always very interesting and normally provoke a response! What do you think of this Raul fella from Porto. I’m going to disagree with the above posters. This just seems a post to dissect Masch’s situation in to another dig at how the club is being run, the club is doing a hell of a lot wrong but I don’t see what here. For all the conjecture offered here we’ve heard reports of M being shunned by his team mates in training and his wage at Barca being £90,000, hardly a great sacrifice. OK Hodgson played hard ball, I expect nothing less the way Barca run around tapping everyone up. The new manager wanted what was best for the club, you can’t turn that in to a negative. I’m disappointed after so many excellent articles on the ownership issue this appears, it reads like a tabloid piece only from the other side. It’s good to have some differing opinions and constructive criticism of what’s posted on here. I tend to ignore the posts that are abusive. There are always two sides to any story, at least two, and if we’ve not learned that as Liverpool fans over the past few years we’ll never learn it. I’ll quickly respond to some of what’s been said in disagreement with the article but it’s late and I should be in bed! And it’s mainly all about opinions this, so there’s rarely ever a true “right and wrong”. The Masch quotes from 25/3/10 – no idea why he said that but he said very much the opposite in other interviews too. Maybe his wife’s unhappiness wasn’t 100% of his reason to want to go – maybe he was just torn between his football wishes and his family wishes. 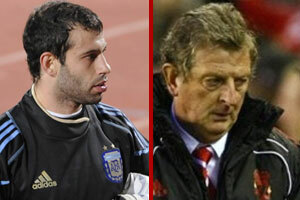 Even Hodgson admitted Mascherano’s personal life was suffering because of his wife’s unhappiness at living in England. The possible move to Italy – Inter Milan have four or five Argentinians in their squad, perhaps Mrs Masch is on good terms with some of the wives. “True market value” – what is that exactly? The fact there was no secret he wanted to leave and only two clubs came in for him suggests the market isn’t brilliant at the moment and that the two clubs who put bids in weren’t willing to pay any more than whatever they offered. We still don’t know for sure what he was sold for, something between £17m and £22m depending on which story you want to believe. If we’d turned Barca and Inter down on Thursday and they’d both pulled out the player would still be unhappy but we’d struggle to get anything like £20m for him in 12 months’ time. “Three million Euros not a lot of money” – He was reportedly on £25k a week at Anfield, so €3m+ is getting on for two years’ wages for him at his LFC rates. Although footballers live in a different world to the rest of us that’s still a significant amount to give up. Hodgson speaking in cold terms / increasingly prickly – Why speak out about it at all? One of the pluses Roy had over other candidates was supposed to be his ability to deal with the pressure that comes from the way the press can be with managers at clubs like ours. It’s still early days but there are signs the pressure’s starting to get to him. We rescued him from West Ham – I could argue with that but to be honest there’s little point. I don’t buy the idea that nobody would have come in for him in the end. In our case the main reason we went for him was because he was available on a loan at a time when we had no money to spend on signing players outright. He’s about to become a former Liverpool player and so we move on, we don’t need to get into detailed arguments about that part of his career. And for what it’s worth he was far from perfect in my eyes, perhaps my biggest worry about him was the way he was so easily riled by opposition players at times. But he did a lot more good than bad for us and I think we should be wishing him well, not getting vindictive because of a rumoured event right at the very end of his career for us. Phil – he was on £25k, not £80k, a week at Anfield according to various reports towards the end of the 2008-09 season. And had we put a deadline on him leaving that we would not budge on we’d not only have got this deal finished (with our without a sale) some time ago but we’d be sending out a message for future deals too. Ray – Good points. What stands out most from what you said is that nobody is clear on what the events were. Even those who witnessed events won’t have witnessed everything that went before it. What comes out of the club is gossip that doesn’t tell the full story and will no doubt be followed up by more tales of division. I don’t agree that EVERYTHING at the club should be dealt with in-house but this type of situation should have been. If news he had refused to play would lower his fee then why are we letting that news out? Yusuf – “he had a contract”. So has Insua – but he’s had his squad number taken from him and is effectively being forced out when he never wanted to leave in the first place. It works both ways. If Insua responds by refusing to leave and insisting that he’ll take his full wages even if he only plays for the reserves you know what the outcry will be – that he’s holding the club to ransom. “Some kind of saint” – I never intended to make that out – I was showing that the idea he was a mercenary were wide of the mark. Back to the idea of 2 or more sides to every story – what that also means is that more often than not neither side is 100% right. Ant – where did Roy actually say Mascherano refused to play? I’ve not seen Roy say that, so I can’t exactly accuse him of lying about it! Raul comes with some rave reviews – and that’s good to hear. Perhaps before you finger point the gaffer as being cold, you might want to imagine yourself being a footballer. That your job is almost always governed by a contract is a given. And if you are a world class footballer you’d be almost sure you’d be playing in a foreign country and club. Now, picture yourself choosing your next club. Should you not expect to ensure that you suss out the club and city first to see if you and your family could settle in? Mascherano was in Liverpool on loan. If his wife had problems adapting, then he should’ve rejected Liverpool’s approach and gone back to West Ham reserves so that his wife could go shopping in London. What if his wife now fails to settle in Barcelona? Is he going to refuse to play again? Would this reporter then be again sympathetic to his cause? As a “wag” I think they would’ve known to expect to travel and live in foreign cities. An ability to adapt would’ve been paramount. Mascherano did not make a mistake in choosing Liverpool, but perhaps he should’ve thought about these two important considerations before choosing either to be a footballer or to marry this lady to be his wife. Masch’s non-show at City was a disgrace. And what’s with the MRS? Sounds like a miserable cow. Poor love, all those millions, must be hard. Don’t know how relevant this is for the move of both Monster and Aquilani but I took my children on the stadium tour last Saturday (21st August). In the Home changing room 2 shirts were significant by their absence – Monster & Aqua…………. Where is my post gone Jim? @Jim et al who think Masc is within his right to not play. I think that Masc has no right what so ever to throw his toys out the pram and either refuse to play or say he isn’t in the right mind to play. Men and women are in Afghanistan as we speak working to put food on the tables for their families who are on the other side of the world. They get up every day and must wonder whether they will ever see their families again. They don’t site personal reasons for not going to work cause they don’t feel right. So what right does a pro footballer have to do the cause such trouble for the fans who pay his wages, footballers need to get in the real world. Steve Lewis is correct. It was not long ago that Mascherano was negotiating a 7-year deal with us to play out the remainder of his career at the club. IIRC the new deal would have put him on 80k a year, and would have been the largest ever player contract at the club. For some reason that all changed. The 3m sacrifice must be put into the context of Mascherano earning 3M pounds a year more at Barcelona. So he ‘sacrificed’ 3M to make an extra 12M. Remember also that this was a pro-barca spanish press selling the deal to their audience, so they want to re-frame his image as being more friendly. It could be that the 3M is in deferred payments, or some other form of arrangement that will allow Barca to push the amount a few years back on their books. I liked your response to everyone. There are many intricacies and conversations that we won’t have heard and it is about opinions – mine is that he isn’t quite as innocent as your article makes out, but maybe we will never know the exact story. As for Roy cracking under pressure, I just don’t buy that argument. Firstly, he’s managed Inter Milan, which must have gave him great experience. And secondly, his considerable length of time managing in the game, albeit with smaller clubs has got to have an impact on someone’s character. He certainly didn’t buckle under the pressure against Trabzonspor because we were a different team in the second half – indeed, in the words of Carra: ‘the manager was great, he kept calm and just told us that one goal and we’d be through’. People who talk about him potentially buckling under pressure are surely not comparing him with Rafa are they? Rafa’s ‘fact’ speech and his constant agitation in his latter interviews reminded me of a man about to crack up, not a cool head strengthened by years of managing ‘big teams’. If Raul scores as many goals as he has tattoos, we’ll be laughing! According to other reports, he was on £80k per week from the moment he signed a permanent deal. And as for him refusing to play, I know that it’s come direct from a player. I also know that all the other players blanked him at Melwood following the City game. You’re right on some aspects, he did some very good things for the club and is a very good player. I have always liked and rated him, but he lost all of my respect with the way he condfucted himself recently. As has been said a million times, nobody is bigger than the club and I happy with the little I know about his replacement. We move forward. Well you should be right shouldn’t you Javier? You get wedges for playing football, so try playing it in what might be one of our most important games this season. O you’ve gone? Not your problem? Selfish little p***k.
So we can gather the lure of playing for Barca was the reason then? The key part of this argument for me is that it’s another example where we find ourselves trying to split everyone into two categories, good or bad, and in turn try to pin all the blame on whoever we’ve put into the bad category. Sometimes it’s not one person to blame, sometimes even the “good” guys act a bit out of turn, sometimes the “bad” guys have a moment of goodness. Personally my frustration about the story was that it was being told as “Mascherano the selfish mercenary who betrayed us all in the pursuit of more money.” Whatever his reason finally boils down to it clearly wasn’t about money – if it was he’d have just taken a similar contract offer from LFC a year ago. The other key part to me is that none of this should have come out anyway. For one thing there was no guarantee a deal would be struck, so I fail to see what good it did the club for the manager to make those suggestions about a player he may have still had in his squad on 1st September. And as far as I can tell it wasn’t RH who leaked the “refused to play” allegations – whoever did (and it probably wasn’t one individual) needs to think a little more carefully about the damage that gets done every time these stories are leaked. We’re all desperate to know what goes on inside the club but most of these stories do the club more harm than good. Mr F – I’ll see if your other comment has gone off into a spam or moderation folder. I think it’s a bit over the top comparing Mascherano’s situation with that of any member of the armed forces on any side of the world. In fact some people might argue we (football fans) need to get into the real world and stop worrying so much about transfer budgets and American “expenses” when there is so much genuine pain and suffering going on in the world. But that’s a discussion that’s going off topic so I’ll leave it there. If everyone in football was honourable there wouldn’t be any contracts, everyone would just do “the right thing”. And if everyone in football was honourable we’d have more situations like that with Raul Meireles where his transfer was very much under the radar with very little by way of unsettling speculation for either club in the weeks and months leading up to the transfer. When this was reported elsewhere it was tied in with reports he was discussing a new four-year contract. 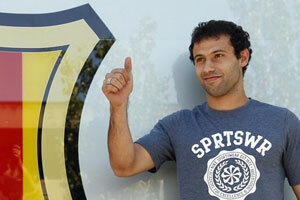 A quick search now suggests that somewhere along the line this became “Mascherano is negotiating a seven year deal”. We could be here all day speculating about what conversations have taken place in the Mascherano household, about whether Fernanda Mascherano was slowly coming round to living in England or if Mascherano had resigned himself to having to continue living with this situation. He might have been talking that way to get Barca’s attention, he might have been trying to show some solidarity at a crucial stage of the season. The interview appeared in April, but was it done before or after Martin Broughton arrived? Maybe his reasons for wanting a move had gone from worrying about his wife to being disillusioned with the future direction of the club, which other players certainly were. I can think of a number of other potential factors but we’ll be here all day. Chances are it was a combination of a number of those things, but unless he reveals all after his move goes through or in an autobiography we’ll probably never know. And even then we’ll be taking his word for it, or his ghost-writer’s, all the time knowing that the lawyers might have stripped one or two details out. @ Ant – I am worried about Roy’s composure, that’s nothing to do with the last manager (or his predecessors for that matter) it’s a genuine concern. Unless we get new owners who decide to treat Roy the way City treated Hughes we know that Roy’s here to stay unless he really makes a bad job of it. I don’t want him to make a bad job of it, I want him to cope well and do more than what Broughton said about him being someone to “steady the ship”. I’m not worried in a way that I think it’s a lost cause but I do think it’s something that can snowball and I hope he finds a way of dealing with it now. @ Adam – I’ve not been able to find a single report that put him on £80k a week from the day he signed permanently in 2008. Everything points to him being on £25k a week, which seems on the low side but of course it was signed just as the owners had gone to war on each other and was only signed after his own “owner” had been given whatever cut he was holding out for. There were reports at the time that the £18m fee included his wages for four years too. The only talk of £80k a week is in reports where he was being offered a new deal last season with a lot of emphasis on him being offered “triple wages”. I’m not disputing that other players are saying Mascherano refused to play. The two issues with that are 1) They shouldn’t be, it’s becoming a problem for the club that so much of this type of story gets out and 2) They probably don’t know the full details of what went on between Hodgson, Mascherano, Purslow, Macia, agents and the rest of it. It’s not easy to keep a lid on everything but as a club we’ve got to try harder to keep training ground gossip from getting out because fact, fiction or a bit of both it doesn’t help the club in any way. And Mascherano’s gone now, so good luck to him but my attention now shifts to Raul Meireles! @ Warren: “So we can gather the lure of playing for Barca was the reason then?” Only if we ignore the other reason he gave in the quotes you’ve posted. He said “my family and the challenge Barcelona provides made me choose Spain”. If we’re going to make assumptions that he says one thing and means another we could just as easily assume he wanted to go to Italy but his wife made him go to Spain! What really needs to change at this club is the underlying atmosphere of hate and mistrust that seems to drip from the top down to the bottom of the organisation. Just for sporting reasons. No doubt his family did play a part but I think it’s pretty clear the main motivation was the ‘sporting reasons’. I’ve on the whole been impressed with the details you have dragged up on Tom&Jerry and the potential owners but this piece appears little more than a witch hunt at the current structure in place, given this, it seems a bit odd to say we need to change this culture of mistrust while furthering it in the above article based on little more than conjecture. My point was to the people who defended Masc and his attitude over the last week or so. Fair play he wants to leave, and fair play his home life isn’t ideal but other people in far less privaledged postitions have to make do, and not just people in the forces. So the point I am making is why should a pro footballer be given sympathy when others don’t get it? I do agree 100% football fans sometimes if not all the time need to get in the realworld. How can we sit there and bang our drums so loudly about buying players for 100’s of millions of pounds, but not give a second thought about the plight some people contend with in the developing world. My earlier post was put in a moderation queue for some bizarre reason, even though I don’t know why as i haven’t altered my email address. Mr F – still not checked to see why your comment didn’t appear. I think the people you’re talking about do get sympathy (but obviously not on sites like this because it’s not what this site covers!) Sympathy goes out on the spot as a reaction to what’s in front of you too, you don’t hold back from dishing it out until you’ve compared it to the plights of others. Warren – I don’t think those comments make it clear what his main motivation was, although they made it clear what wasn’t his main motivation – money. Sometimes we take comments from people in the game a little too literally, not always a good approach – especially when a player’s not speaking in his first language or the comments have been translated from another language before we’ve seen them. Anyway, Mascherano’s gone now, good luck to him, looking forward to seeing our new number 4 in action after the internationals. Thanks for the memories (except OT, but that was really that bald prick’s fault), and good luck at Barca, though I have to admit my respect for your new club has been greatly diminished. Ignore all the whinging and self-righteous criticism coming at you. How we will long for the days of you and Xabi in the heart of our midfield in the next few seasons. You may have not handed it perfectly, but 90% of the blame lies with Cecil Purslow, Eddy Macia and RH. According to Graham Hunter in Spain Barcelona were the ones who were behind Mascherano not playing. They told him to not to play so as to force the issue and he did it. Also Hunter went on to say that he was privy to info that Barcelona last weekend leaked it to the press that they had already agreed terms of contract with the player, the details of the contract appeared in a Spanish newspaper. So for me Hodgson is justified to say what he said. What really gets me about the whole situation is the attitude of the players wife. I will accept that any player should put his family first but my problem is that although his wife should be living in England 4 years now she still cannot speak English. Thats not exactly embracing the culture or giving England a proper go. It was inevitable England would be a stop gap when you dont learn the language. So as good a player I believe Masch to be I think the way he and Barcelona about the transfer was nothing short of a disgrace. Also I think its pointless consistently blaming the board for everything wrong with the club. I despise the owners and dont trust any one of the board but I think is crazy trying to apportion some kind of blame on the board whenever anything negative happens at the club. Whether they are doing right by the club is questionable but I think if we blame them for everything all of the time it becomes less believable when they actually do something untoward. @Juan I agree with you. Also to add to your point Aldo xaid yesterday on the commentry on the radio that he thought that Javier was out of order. He said he had heard that the players had given him the cold shoulder on the Tuesday because of his attitude and subsequent no show on Monday. I also think that RH has done nothing that no other manager would do and he was fully vindicated in saying what he did.